This is one of the [tag]basketball offensive moves[/tag] I picked up from Mark, one of my readers. Try this out with your team tonight! A [tag]basketball[/tag] [tag]drill[/tag] that works very well for [tag]rebounding[/tag] and increasing aggressiveness on the boards. 3 players under the basket with [tag]coach[/tag] standing out of bounds. Coach tosses ball in and player that has ball is on [tag]offense[/tag]. 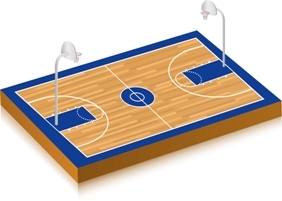 No dribbling allowed except one power dribble to clear self if needed. It is nonstop with man with ball Vs. 2 others on [tag]defense[/tag] with shots being mostly put backs. Allow players to get physical with bumping and pushing. 1st player to make 3 baskets wins. Others have to do frozen push up. 3-5 reps of this is plenty.